Hillwood Estate, Washington, D.C., U.S.
Marjorie Merriweather Post (March 15, 1887 – September 12, 1973) was an American socialite and the owner of General Foods, Inc. She used much of her fortune to collect art, particularly pre-revolutionary Russian art, much of which is now on display at Hillwood, the museum that was her estate. She is also known for building Mar-a-Lago. Marjorie Merriweather Post was born in Springfield, Illinois, the daughter and only child of C. W. Post and the former Ella Letitia Merriweather. At age 27, when her father died, she became the owner of the rapidly growing Postum Cereal Company, founded in 1895. She was subsequently the wealthiest woman in the United States, with a fortune worth about US$250 million. Post attended the Mount Vernon Seminary and College (now the George Washington University's Mount Vernon Campus). She maintained a close lifelong relationship with her alma mater and served as its first alumna trustee. Today, a collection of her correspondence with Mount Vernon administrators is maintained by GWU's Special Collections Research Center. Post's complete collection of personal papers, as well as those of her father, are held by the University of Michigan's Bentley Historical Library. 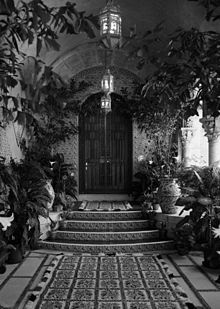 In addition to Hillwood and other estates, Post's other lavish home was Mar-a-Lago in Palm Beach, Florida. 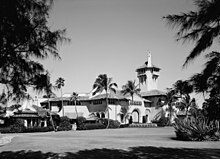 Designed by Marion Sims Wyeth and Joseph Urban, Mar-a-Lago was willed in 1973 to the United States federal government as a retreat for presidents and visiting foreign dignitaries. The mansion was not, however, used for this purpose, prior to being declared a National Historic Landmark in 1980. Post and her second husband, E. F. Hutton, owned Sea Cloud (Hussar V), the largest privately owned sea-going yacht in the world at the time. 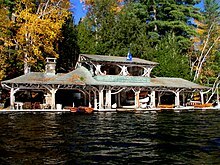 Post also owned Camp Topridge on Upper St. Regis Lake in the Adirondacks, which she considered a "rustic retreat". It included a fully staffed main lodge and private guest cabins, each staffed with its own butler. The expansive Great Camp, built in 1923 by Benjamin A. Muncil, eventually contained nearly 70 buildings, as well as a Russian dacha, on 300 acres. It was one of only two Adirondack camps to be featured in Life magazine. Another home, which she shared with Joseph Davies in Washington, D.C., was called Tregaron. Some of Post's jewelry, bequeathed to the Smithsonian Institution in Washington, DC, is displayed in the Harry Winston exhibit. Pieces in the collection include the Napoleon Diamond Necklace and the Marie Louise Diadem, a 275-ct (55 g) diamond-and-turquoise necklace and tiara set that Napoleon I gave to his second wife, Empress Marie Louise; a pair of diamond earrings set with pear shapes, weighing 14 ct (2.8 g) and 20 ct (4 g), once belonging to Marie Antoinette; the Blue Heart Diamond, a 30.82-ct (6.164 g) heart-shaped blue diamond ring; and an emerald-and-diamond necklace and ring, once belonging to Mexican emperor Maximilian. Post funded a U.S. Army hospital in France during World War I, and, decades later, the French government awarded her the Legion of Honour. The Merriweather Post Pavilion, an outdoor concert venue in Columbia, Maryland, is named for her. In 1971, she was among the first three recipients of the Silver Fawn Award, presented by the Boy Scouts of America. The 425-acre (172 ha) Lake Merriweather at Goshen Scout Reservation in Goshen, Virginia, was named in her honor. During the 1930s, the Soviet government under Joseph Stalin began selling art treasures and other valuables seized from the Romanov family and former Russian aristocrats after the Russian Revolution to earn hard currency for its industrialisation and military armament programs. Critics[who?] have claimed that these items were expropriated; however, Post and Davies's transactions were from the recognised governmental authority. Neither she nor Davies were involved with the original seizing of the items. Allegations later surfaced that many works of art from the Tretyakov Gallery and other collections were either donated or offered at nominal prices to Post and Davies, who were both art collectors. Davies is also alleged to have purchased art expropriated from Soviet citizens well after the Russian Revolution, including victims of Stalin's Terror at discount prices from Soviet authorities. Many of the items, which remain under the control of the Post estate or its agents, can be viewed at Hillwood, her former estate. Hillwood has operated as a private museum since Post's death and displays her French and Russian art collection, featuring the work of Fabergé, Sèvres porcelain, French furniture, tapestries, and paintings. Adelaide Close (1908–1998), who married three times, to Thomas Wells Durant, Merrall MacNeille, and Augustus Riggs IV. Eleanor Post Close (1909–2006), later known in the media as "Eleanor Post Hutton", married six times, to film director Preston Sturges, Etienne Marie Robert Gautier, George Curtis Rand, Hans Habe, Owen D. Johnson (son of author Owen Johnson), and orchestra conductor Léon Barzin. Via his second marriage, Edward Bennett Close would later become the paternal grandfather of actress Glenn Close. Nedenia Marjorie Hutton (1923-2017), better known as the actress Dina Merrill. 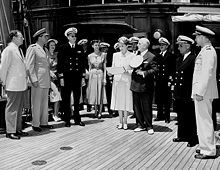 Marjorie Merriweather Post and her husband Ambassador Joseph E. Davies (center) with Carlton Skinner at a presentation of a Naval Reserve Pennant. In 1935, Post married her third husband, Joseph E. Davies, a Washington, D.C. lawyer. They had no children and were divorced in 1955. From 1937 to 1938, in a crucial period leading up to World War II, Davies served as the American ambassador to the Soviet Union, ruled at that time by Joseph Stalin. During this time, Davies and Post acquired many valuable Russian works of art from Soviet authorities. In 1951, their Long Island estate, which she had purchased in 1922 with Hutton, located in Brookville, New York, was sold to Long Island University for $200,000. It became C.W. Post College in 1954, now known as LIU Post. In 1966, she became honorary housemother of Zeta Beta Tau's Gamma Delta chapter, often hosting the fraternity brothers for brunches. Post served as the honorary house mother of the college's first local fraternity, Sigma Beta Epsilon, which, in 1969, became the New York Beta chapter of Sigma Alpha Epsilon. Since Post had borne only girls, she referred to the fraternity of sons-in-law as her "boys", while they called her "Mother Marjorie". Post was honored by Sigma Alpha Epsilon fraternity as a "Golden Daughter of Minerva". Her final marriage, in 1958, was to Herbert A. May, a wealthy Pittsburgh businessman and the former master of fox hounds of the Rolling Rock Hunt Club in Ligonier, Pennsylvania. That marriage ended in divorce in May 1964 and she subsequently reclaimed the name Marjorie Merriweather Post. Post died at her Hillwood estate on September 12, 1973, after a long illness, and was buried there. The bulk of her estate was left to her three daughters. She appears as a character in the movie Mission to Moscow (1943), played by Ann Harding. As of 2008[update], a film based on The New York Times feature "Mystery on Fifth Avenue", describing a riddle-laden renovation of a triplex undertaken by Eric Clough and the architectural firm 212box, built for Merriweather Post in the 1920s, was in development by J. J. Abrams. Animal Collective's 2009 album Merriweather Post Pavilion is named for the pavilion that bears her name. ^ Robertson, Nan (2 July 1978). "A Lot of Grape Nuts". The New York Times. Retrieved 9 December 2016. ^ "Post Family Papers: 1882-1973". quod.lib.umich.edu. Bentley Historical Library, University of Michigan. Retrieved 2017-02-23. ^ "Sea Cloud - IMO 8843446 Sea Cloud, bt. 1931, gt. 2531". Retrieved 13 December 2014. ^ Times, Special To The New York (28 April 1985). "State Finds No Buyer For Mountain Camp". The New York Times. Retrieved 9 December 2016. ^ Rubin Stuart, Nancy (1995). American Empress: The Life and Times of Marjorie Merriweather Post. New York: Villard. ISBN 0-679-41347-2. ^ "Maximillian Emerald - Smithsonian Institution". ^ "Blue Heart Diamond - Smithsonian Institution". ^ "The Best Amphitheaters in America: Merriweather Post Pavilion, Columbia, Maryland". Rolling Stone. Retrieved January 17, 2015. ^ a b c Fabrikant, Geraldine (16 March 2011). "Hillwood Museum Plans Society Bridal Exhibit". The New York Times. Retrieved 9 December 2016. ^ a b c d e Times, Special To The New York (13 September 1973). "Mrs. Marjorie Merriweather Post Is Dead at 86". The New York Times. Retrieved 9 December 2016. ^ "Mrs. Post's Will Filed in Capital". The New York Times. 26 September 1973. Retrieved 9 December 2016. ^ "Observer". Archived from the original on 2008-06-24. This page was last edited on 22 March 2019, at 03:11 (UTC).